Dec. 30 (Bloomberg) — Sri Lanka’s stocks, Asia’s best- performing in 2009, may extend gains as the end of a 26-year civil war and low interest rates help boost economic growth, the island’s biggest fund manager said. The Colombo All-Share Index, which rose to an intraday record of 3,378.43 today, may climb to 3,500 in two months, said Bimanee Meepagala, an analyst at Eagle NDB Fund Management Co., the nation’s biggest non-state fund. The gauge has jumped 128 percent this year, the world’s second-best gainer after Russia. The central bank has cut lending rates five times this year to a five-year low as inflation plunged from a record high in June 2008. Rajapaksa has called a presidential election for Jan. 26, two years before his mandate expires, as he seeks to capitalize on the end of the war with the Liberation Tigers of Tamil Eelam in May. Gross domestic product expanded 4.2 percent in the third quarter from a year earlier, the fastest pace in 2009, after gaining 2.1 percent in the three months to June 30, the statistics department said Dec. 18. Sri Lanka’s exports in October declined 4.9 percent, the least this year, as orders increased for the South Asian island’s tea and rubber. Tourist arrivals in Sri Lanka have increased since June. Aberdeen holds shares of Commercial Bank of Ceylon Plc , the country’s biggest non-state lender, and John Keells Holdings Plc, the hotel and tea plantation owner that has the largest weighting on the benchmark index. Selling by Raj Rajaratnam, the billionaire Galleon Group LLC founder accused of insider trading, won’t cause an “overhang” on the Colombo Stock Exchange “as there are plenty of buyers in the market,” Eagle NDB’s Meepagala said. Mobius, chairman of Templeton Asset, said last month he’s seeking private equity or strategic investments in Sri Lanka after the end of the war. Rogers also said in August the nation’s stocks may offer better returns as the government may spend more on infrastructure and agriculture. The International Monetary Fund, which granted Sri Lanka a $2.6 billion loan in July, expects the island’s economic growth and credit demand to pick up from this year. John Keells Holdings, also Sri Lanka’s biggest diversified company, and Aitken Spence Plc, the island’s largest operator of resorts, are also likely to post gains in earnings next year, Meepagala said. A resort set on an island in a Kerala backwater called the river of flowers and managed by the Sri Lankan hotel group, Aitken Spence, sounded perfect for a few days relaxation. The flight to Trivandrum took only 45 minutes, immigration and customs at the airport were swift and smooth, and within 20 minutes of arriving in India I was in a hotel car bound for the Poovar Island Resort. The drive from the airport is along a highway lined with shacks, suburban villas and yards stacked with antique doors and window frames, before deteriorating to pot-holed rural lanes. A boat with an outboard motor was waiting at the small Poovar jetty for the slow chug along the Poovar River (named after the red flowers that used to float in it) to the resort. The boat had to be driven slowly so as not to churn up too much wash that would capsize the fragile wooden canoes piled high with sand being punted up river from the beach. The main accommodation is in a warren of compact cottages accessed by boardwalk raised above the marshy garden and set in 24 acres of tropical parkland. Exotic trees abound but mostly the vegetation is free range. Eagles, owls and pretty river birds enjoy the gardens while crows lurk for pickings from the tables of guests breakfasting on their verandahs. The social centre of the resort is a large swimming pool between the reception and dining villas. The pool is a wonderful meeting point for sun-bathing Britons on all-inclusive package holidays and Indian families taking a winter break from the cold north. I had been staying three days before I realised there is a second swimming pool (and restaurant) in the secluded Ayurveda Village of 12 cottages, popular with Europeans in search of treatment as well as wellness therapy. The meals served in the garden or on the verandah of the main restaurant, and prepared under the direction of a Sri Lankan executive chef, Krishan Rupasinghe formerly of the Neptune Hotel, Beruwela, are resolutely Indian inspired. I indulged in Masala Dosa for breakfast, Kerala style Mutton or Malabari veg curries for lunch and fragrant river fish and deliciously subtle curries for dinner. The hotel’s CEO is R. Sritharan, formerly of the Tea Factory and Bandarawela hotels, who brings a touch of old style Sri Lankan hospitality and charm to the resort. I spent my days strolling in the park, visiting the resort’s newly opened tailor shop (I was the first customer) where a young man made me a linen safari suit in 24 hours, and reading on the verandah of my premium grade room. This was on the ground floor of a four-roomed Kerala style mansion furnished with a rattan theme but with flat screen television and tea/coffee maker. The wow factor was the huge bathroom with Jacuzzi and a rain shower in a glass cabinet with secret access to an ornamental walled garden hung with a profusion of potted plants. There was no pressure to do anything at the resort, which was what I wanted. Of course, I could have taken a backwaters cruise, gone bird watching, practiced yoga, or tried ‘Padabhyangam’ rejuvenation massage. But the most memorable moment was when I left the resort by boat at dawn as the sun rose and created mystical silhouettes out of the trees overhanging the enigmatic waters of the river of flowers. The ‘five-star’-category urban luxury resort Heritance Madurai has roped in the Madurai-born international DJ Ricky to perform in its New Year celebrations. The celebrations would feature video DJing, which is a new concept and introduced only this month even at Abu Dhabi, according to Srinith De Silva, general manger of the hotel, which is a venture of the Chennai-based hospitality group ETL Hospitality Services. Speaking to reporters here on Wednesday, he said that this was the first time Heritance Madurai was organising such a New Year bash. It would feature fashion shows, games, and a dinner with a special multi cuisine buffet. All the guests would get a Rs.500-worth gift vouchers. The stage has been set with imported equipments. An extravagant show of fireworks has also been scheduled. The celebrations would be “one-of-its-kind” in the Temple City, said Mr. De Silva. Mr. Ricky said that the music would have a good chunk of international songs as there were many foreigners staying at Hotel Heritance. It would also feature video-mix of songs of regional languages. While the tickets for a single person is Rs. 1,500, it is Rs. 2,900 for couples and Rs. 800 for children below 10 years. Tickets could be obtained from the Hotel. Aitken Spence Hotels’ latest foray into the Indian market, takes the company to New Delhi, where a brand new property is due to open February / March 2010. Mr. Malin Hapugoda, Managing Director of Aitken Spence Hotels with Mr. Indrajit Singh Executive Director of Sartaj Hotel Apartments & Villas after signing the management agreement. The 130-roomed, Ramada Hotel & Convention Centre will be laid out on a spectacular property spanning twelve acres, just ten minutes from the international airport on the Gurgaon airport expressway, in the famous Celebration Gardens, one of the foremost outdoor wedding locations in New Delhi. All rooms will be well-equipped with the latest amenities, like high-speed wireless internet access, multimedia hubs and laptop safes, as well as additional features such as flat screen televisions with satellite channels and bathrooms with bathtubs. Room types will include six suites and villas, all elegantly designed in a combination of timber and Italian marble. The hotel’s diversity of dining options will include a speciality restaurant, a coffee shop and a trendy bar. The entrance to the speciality restaurant will be via a bridge, suspended over an abundance of lush foliage, creating a luxurious ambience. For a more down-to-earth, yet splendid spread, the multi-cuisine coffee shop is open for all-day dining. Additionally, the hotel will incorporate a fully-fledged business centre and a range of conference and banquet facilities. Situated next to the hotel, accessible by a hanging walkway, the ballroom will be able to accommodate up to two thousand guests. The hotel will also have at its disposal, two breathtaking garden locations ideal for functions with a guest-count up to another thousand. The hotel will join a network of twenty seven hotels located in Sri Lanka, India, Oman and the Maldives. Located in some of the key tourist locations the Aitken Spence chain boasts of exotic properties such as Barefoot at Havelock located on the “The Best Beach in Asia” as rated by the Time Magazine, award winning eco-friendly properties, such as Heritance Kandalama, situated in close proximity to five UNESCO world heritage sites and Desert Nights Camp, Al Wasil, Oman, rated as one of the top ten desert retreats in the world. The chain’s Heritance Tea Factory has been voted by the Independent, UK as one of the ‘Top Five Factory Hotels’ in the world and one of the best 100 places to stay in the world by the Sunday Times, UK. The company’s unique resorts are operated under the brand Heritance and plans are afoot to launch India’s second Heritance property in 2011 with the opening of Heritance Cochin, a luxury resort with floating villas. The latest addition will join the Heritance Hotels & Resorts portfolio which already includes Heritance Kandalama, Heritance Ahungalla, Heritance Tea Factory and Heritance Madurai. Aitken Spence Hotels is part of Aitken Spence PLC, a diversified Sri Lankan conglomerate which was recognized by Forbes as one of the most successful publicly traded companies, outside of the US, for 3 consecutive years. Heritance Tea Factory was adjudged the runners up at Star Awards 2009 for the Best Performing Entrepreneurs (Medium Scale – Service Sector) in the Central Province. The awards were organized by the Department of Industries and Development & Enterprise Promotion (Central Province) and sponsored by the Ministry of Industries. No organization qualified for the first place in the above category. Dec. 18 (Bloomberg) — Sri Lanka’s economy expanded at the fastest pace this year as the end of a civil war and five-year low interest rates spurred consumer and company spending. Stocks rose to a record. Gross domestic product rose 4.2 percent in the three months ended Sept. 30 from a year earlier after gaining 2.1 percent in the previous quarter, the statistics department said in a statement in Colombo today. The defeat of Tamil Tiger rebels in May this year after 26 years of war has encouraged some of the island’s biggest companies including John Keells Holdings Plc and Aitken Spence Plc to expand their business. The central bank has room to maintain rates at current levels because of low inflation, Governor Nivard Cabraal said last month. Aitken Spence PLC was awarded the 2nd Runner-Up in the overall category at the 6th Annual Best Corporate Citizens Awards organized by the Ceylon Chamber on 10th December 2009. This is the second consecutive year that Aitken Spence has been recognized as among the top corporate citizens in the country. Aitken Spence also received an award for being among the Top Ten Corporate Citizens. The Chamber evaluates companies on its performance with regards to the environment, community relations, employee relations, customer/supplier relations, economic contribution and governance. Sri Lanka’s popular hill country hotel, The Tea Factory, is being re-branded as a Heritance Hotel on 15 December. This is the natural outcome of the successful development of an abandoned tea factory building into an eco-friendly, world class hotel. Recognizing that a hotel does not stand in isolation but is part of its social and ecological environment, the group wanted a name that conveyed its commitment to the local community as well as to the expectations of discerning guests. Thus: Heritance – a merging of heritage and inheritance. The embracing of inheritance in the name acknowledges an appreciation for the inherited locality and environment of every Heritance property. It signifies a responsibility to safeguard and enhance for the future all that is inherited. The essence of Heritance is expressed in the service excellence and the local flavour, warmth and involvement that are hallmarks of a Heritance Hotel. It conveys a sense of duty for sustaining the natural resources of the locality of each property. The idea of turning the tea factory on a hilltop towering over Hethersett village into a hotel was that of Aitken Spence director G C Wickremsinghe. Since it opened in 1996 it has become one of the world’s most unusual places for a holiday where one can truly experience life as it were on a tea estate during the colonial era. This depicts the true essence of a Heritance property where guests are able to experience the locality and community that surrounds the hotel. With its branding as a Heritance resort, The Tea Factory joins Heritance Kandalama, Heritance Ahungalla and Heritance Madurai as a hotel of choice for the contemporary, eco-savvy tourist. Already popular with visitors as Sri Lanka’s first theme hotel with its heritage of tea, the hotel’s refurbishment has added comfort while its new focus has resulted in rare refinement. This shows even before guests reach the hotel and they are saluted by a stately uniformed barrier guard. Doormen in regal livery stand ready to help guests alight from their vehicles while uniformed stewards offer a welcome cup of hot spiced Hethersett tea. The lobby, with its reception desk created from cogwheels and its soaring atrium supported by solid green and red painted girders from the original factory, inspires awe. Plump sofas and armchairs have replaced wicker furniture and there is ample room to lounge and gaze out through the original wooden casement windows to the tea gardens and hills beyond. Milestones around the lawn indicate the distance from various towns: 258km from Bentota, 230km from Anuradhapura, 180kms from the airport. At 2,072ms above sea level the mingling of mist and sun is as dramatic as the cool air is refreshing. At the other side of the lobby, the Kenmare Restaurant features new menus, new accessories, and the sparkling, positive Heritance attitude by staff keen to oblige. Tea themed cuisine like “Smoked chicken salad with tea vinaigrette,” “Tea and coconut crusted mullet” and “Hethersett tea mousse in tulip with seasonal berries” are also on offer. The Hethersett bar has every kind of wine and spirits as well as especially created tea cocktails. Try “Planter’s Best” a wine glass of brandy and strong, spiced hot tea to warm up. Adjoining it the TCK CK6685 railway carriage fine dining saloon features a new seven course, fixed price menu with enough choices to satisfy the most demanding gourmand. A memorable High Tea is served in the tea lounge every afternoon with sandwiches and cakes and tea prepared individually for every guest from their own choice of leaf. Every bedroom on the four floors of the former tea drying lofts has been refurbished to a warm and reassuring cosiness. The board floors have deep pile carpets; the furniture is wooden and practical; and the compact bathrooms have an added sliding glass door for the shower/bathtub. Each room has its own tea/coffee set up, together with boxes of leaf tea (no tea bags!) for a taste of the hotel’s own brand of tea. Even the bottled water comes from the hotel’s own spring where a certified water plant, disguised as a plantation bungalow, produces 4,600 bottles a day for all the Aitken Spence hotels. While some hotels in Sri Lanka have upgraded to boutique properties offering guests every conceivable luxury, Heritance Hotels have gone further. At the Tea Factory addressing guests’ concern for conserving the environment was paramount in its renewal as a Heritance property. For instance, hot water and central heating are provided by biomass from locally farmed gliricidia wood instead of from atmosphere-polluting, imported diesel. Waste and water management is based on sustainable recycling processes; vegetables are organically grown or sourced locally, generating income for the area. Through its Welfare Society, the hotel sponsors community development projects. Guests can stroll on their own eco walks to explore the locality or join in organized trekking three times a day through the nearby Kudawatte jungle watching for birds and wild animals. 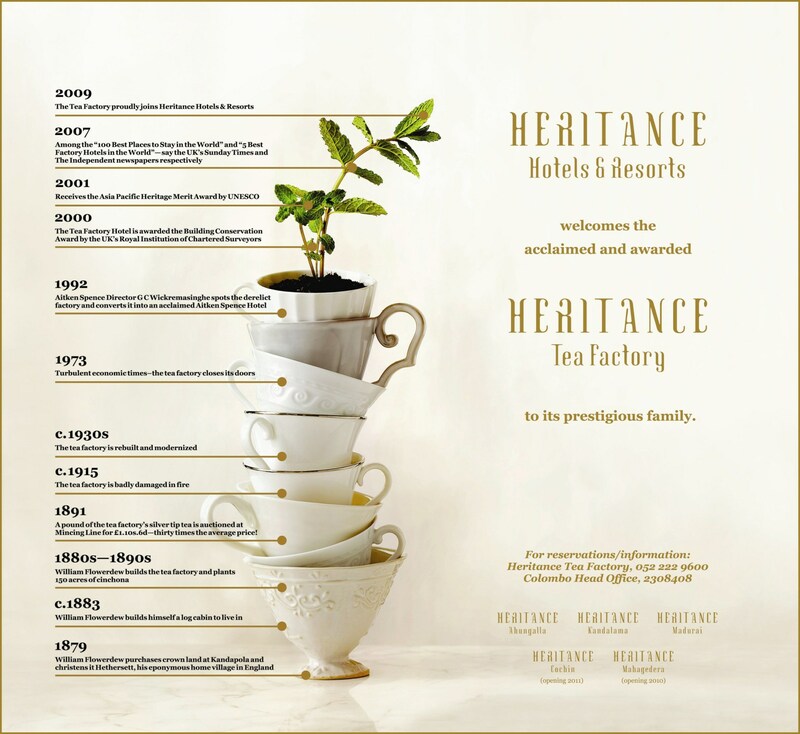 The Heritance Tea Factory experience invites guests to take part in tea plucking and see the tea they have plucked being processed in the hotel’s Micro Tea Factory and have it presented to them in a packet the next morning. Other activities include mountain biking; mini golf; cultural events with the village community; and being rejuvenated in the Six Senses Spa. As The Heritance Tea Factory, the hotel is set to become more than an unusual place to stay, adding a satisfying experience of Sri Lanka’s heritage to the perfect holiday. Statement from Mr. J M S Brito, Deputy Chairman/Managing Director of Aitken Spence PLC in support of the UN Seal the Deal! campaign calling for a fair, balanced and effective post-Kyoto climate agreement at the UN Climate Change Conference (COP 15) to be held from 7-18 December 2009 in Copenhagen.